Its name, American Alarm & Communications Inc., connotes a big national company. But the Arlington-based company is actually a small family-owned business whose main service areas are Eastern and Central Massachusetts and New Hampshire. The 36-year-old company provides burglar and fire alarm and surveillance video systems for homes and businesses. The original name of the firm was FamilyGuard, but that was changed "after we saw the potential for going national at some point," said Wells A. Sampson, president and son of the founder, Richard L. Sampson, 70, now chief executive officer and chairman. Wells Sampson, 42, oversees day-to-day operations. Although American Alarm receives "routine calls every week about being acquired from those in and outside our industry, we're not interested because we want to continue to grow our business," Sampson said in a recent interview in the company headquarters, located, fittingly, behind the Arlington center fire station. Other offices are in Worcester and Manchester, N.H. American Alarm has subcontractors to cover the rest of New England. The company became profitable in 1980, nine years after it was created, and had revenues of $10 million in 2000, said Sampson, a Carlisle resident. "And we've been growing ever since," he added, declining to be specific for proprietary reasons. There are 130 employees, most of them in Arlington. Giant corporations like ADT, Brinks, and SimplexGrinnell dominate the $26 billion-a-year US industry. "However, there are lots of small- and medium-size firms represented," said Georgia Calaway, spokeswoman for the National Burglar and Fire Alarm Association, based in Irving, Texas. An estimated 33 percent of the industry's customers are residential, the remainder commercial-industrial, Calaway said. American Alarm has about 9,000 residential customers and 5,000 business clients, but the latter account for 75 percent of system installations annually, Sampson said. The commercial business eclipsed the residential in the mid-1990s, he said. Vacuum Barrier Corp. of Woburn has been a customer for 27 years. The cryogenics pipe manufacturer has fire alarm and security systems. "They've done a fine job for us, especially in monitoring our plant," said David Tucker, an owner of Vacuum Barrier. 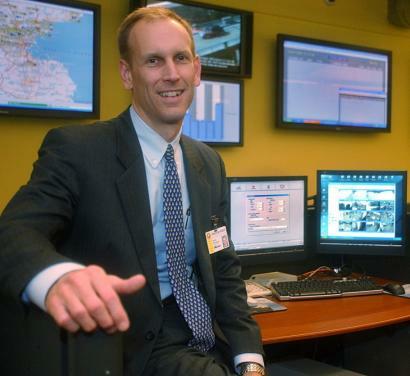 American Alarm has a computerized command center in Arlington that keeps track of all installations. Prices of burglar and fire alarm systems for residences and small firms are between $1,000 and $3,000, said Sampson. For large companies, prices are $3,000 and up, he said, pointing out that an integrated system, including a card-access system, can be as much as $500,000. The complex technology of today, he said, is a far cry from what it was when his father began tinkering with fire alarms in the basement of his Winchester home in 1971 with a few fellow graduates of the Massachusetts Institute of Technology. "My father then was a financial analyst in Boston, and he and his friends bought products from other vendors and fashioned them for residential uses mostly," Sampson said. His father began working full time at the company in 1977. The company's first offices were in Winchester, where the elder Sampson still lives. In 1983, it relocated to a former Arlington Police Department building. "A former cell block in that building became our 24-hour monitoring station," Sampson said. The move to the current headquarters off Broadway occurred two years ago. Sampson and his brother Louis were making their own career moves until the late 1990s, when they joined the family business. "We were attracted by the growth of the family business," said Sampson, who came on board in 1998, after having been a manager for Invensys, a Foxborough factory automation firm. Louis, 39, who lives in Winchester, signed on in 1996 from Sapient Corp., a Cambridge-based information technology consulting firm. He is now American Alarm's chief operating officer and chief financial officer. The two brothers also co-own the company along with their siblings, Rich, 43, of Winchester; Nancy Sayegh, 38, of Waterville Valley, N.H.; and Mary Sampson, 36, of Arlington. The family company's continuing big challenge, albeit not an overwhelming one, is competing against large national companies, Sampson said. "Our task is staffing up to provide superior, personal service." On the industry front, he is a legislative team member of the Massachusetts Systems Contractors Association, which represents 200 businesses that are promoting licensing reform. The Legislature is studying proposals for one license to be issued to all workers falling under the expanding telecommunications umbrella, said Gloria Craven, principal of Craven & Ober Policy Strategists, a Boston government relations firm that is a consultant to the contractors association. Current licenses are for electrical, fire-warning, and security specialists as well as those in a category called other power limited systems, which includes telephony, sound, data, and video, said Craven, a Medford resident, and Sampson. "A single license model just makes good sense, as it does, for example, for doctors, nurses, and lawyers, who come under one license" in their respective professions, Sampson said.